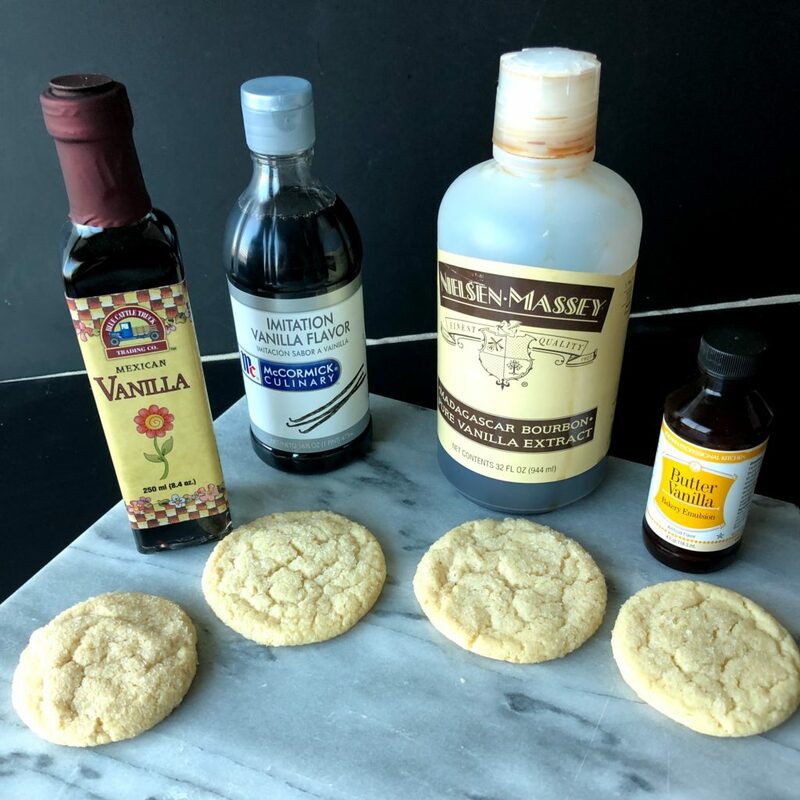 I have adopted the long-standing tradition that PURE vanilla extract is the one and only flavoring worthy of my cookies. I use Nielsen Massey Madagascar Bourbon Vanilla in alllll my baking. It’s deep, nuanced flavors speak to my palate. 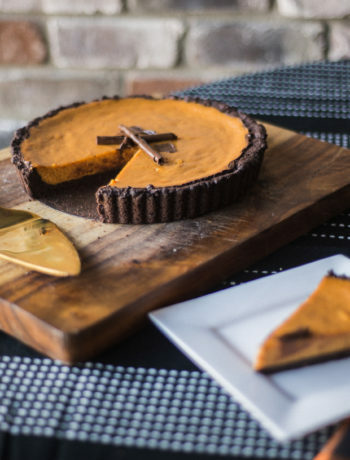 The flavors translate into a dessert with personality, standing out from the bland competition. I’ve been buying 32oz bottles of pure Nielsen Massey vanilla for over a decade, feeling confident I was using the best product for making desserts and treats. Until I read this. And this. Evidence suggesting that imitation vanilla may perform just as well (and sometimes better!) than pure vanilla. And, thus began my vanilla identity crisis. The information included in the blog post is the result of hours of researching (and soul searching) about vanilla. Let me share what I’ve learned. Vanilla is a flavoring derived from Vanilla orchid plants. The Spanish name, Vainilla, translates to “little pod.” The fruit is a long bean containing an oily liquid full of tiny seeds. Originating from Mexico, vanilla has been cultivated in South American since the early 15th century. In 1819, European entrepreneurs sent vanilla plants to Madagascar, hoping to produce vanilla there. But it was unsuccessful for years. 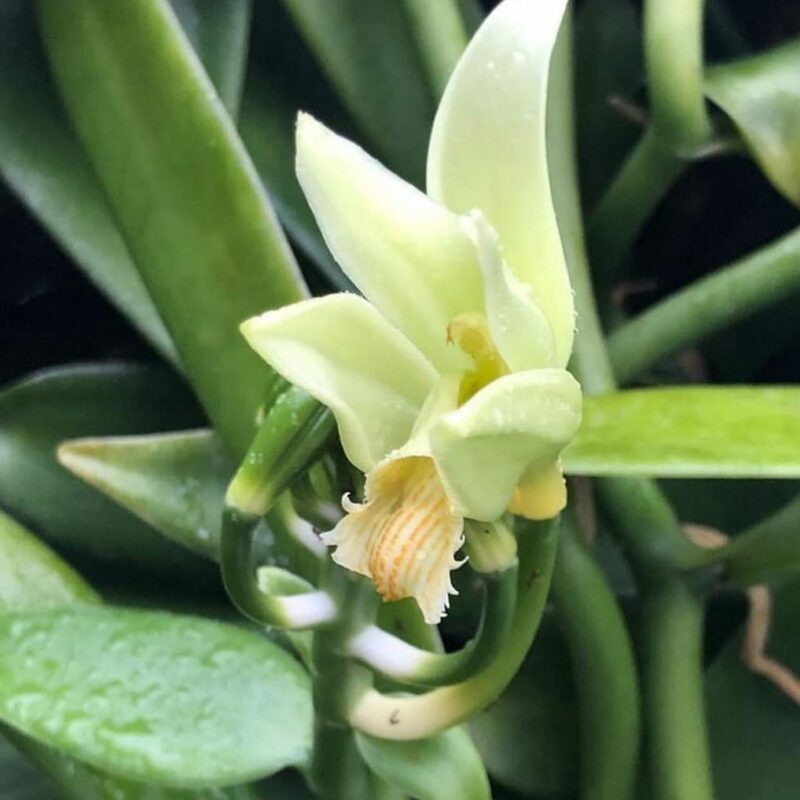 Vanilla orchids require precise pollination from the Melipona bee, only found in Mexico. It wasn’t until they discovered how to hand-pollinate the flowers that they were able grow vanilla beans. Now, vanilla is grown many countries, with Madagascar, Indonesia, and Mexico leading in production. Many try to grow vanilla, but many fail! The growing process very labor intensive. 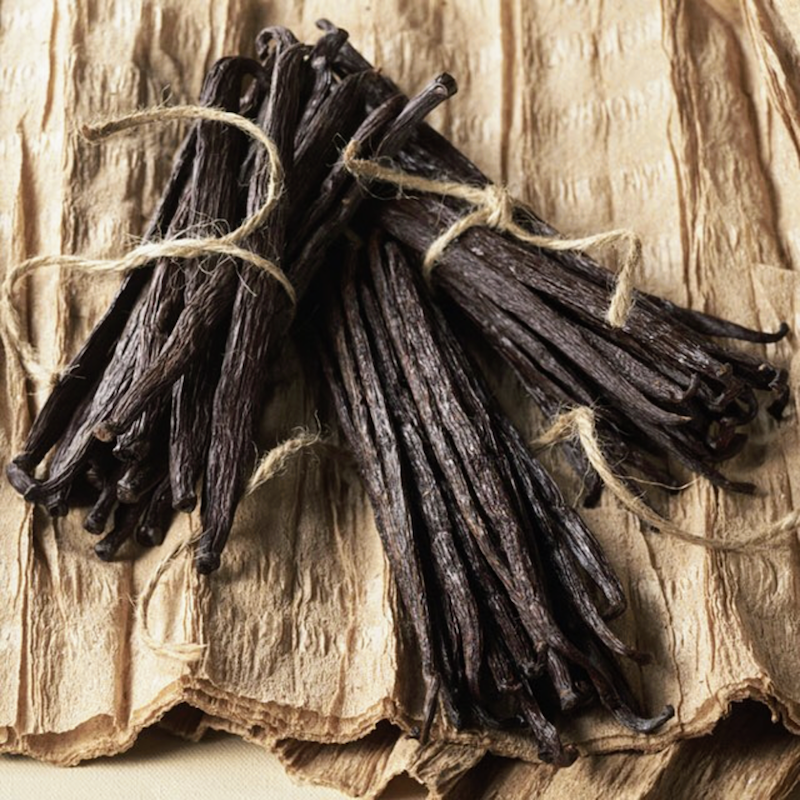 Only careful production methods will produce vanilla beans. The plants must be properly attended to for three years before the orchid will flower. Then the flower must be pollinated within 12 hours of opening. The bean grows within five to six weeks, but needs about six months to reach maturation. It requires a lot of tender, loving care along the way. As a result, vanilla is the second-most expensive spice after saffron. But the world’s consumption of vanilla is more similar to table salt! We love vanilla and production is struggling to keep up with demand. When you understand the basics of vanilla production, you begin to get a better sense for the cost of vanilla. But, if vanilla has been produced since the 15th century, why has the price for vanilla suddenly quadrupled in the last few years? Well, there aret a few factors contributing to the increased price. 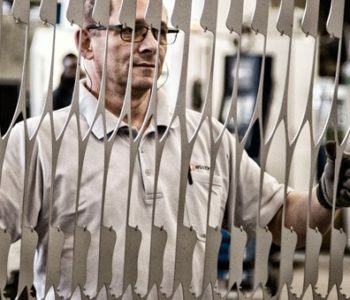 First, production began to diminish in 2007. Low economies worldwide resulted in a low price for vanilla. And remember all the tender, loving care vanilla plants require? Farmers were not willing to invest in growing vanilla for such low wages. But, that didn’t stop us from wanting vanilla! Now, demand for pure vanilla extract is at an all time high. Consumers are more educated and more insistent that their food be made from natural ingredients. Both Nestle and Hershey quit using artificial flavors in certain foods in 2015. With big food companies increasing their usage, prices began to rise. Now, add a cyclone to the mix. On March 7, 2017, a storm tore through Madagascar, destroying the main vanilla growing areas. With the land ravaged, the vanilla plants and the surrounding protective foliage need to regrow. And do you recall how long a plant needs to grow before it will even flower?? Three years. Three years. We are not yet two years out from the cyclone. We haven’t seen the end of this! But, even when vanilla production does recuperate, I don’t think we will see the price drop. 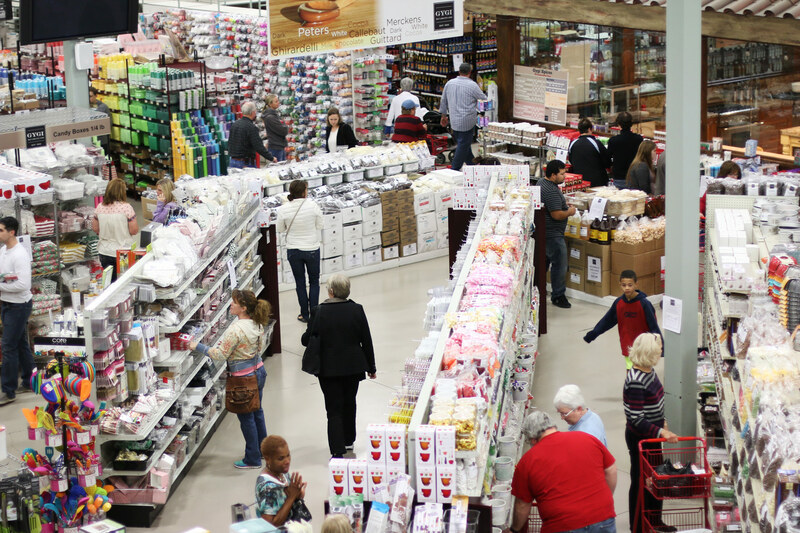 Consumers are now paying a price equal to the product. It is a precious commodity and it should be treated as such. Vanilla extract is a solution of vanilla bean extractives, alcohol and water. Its primary flavor compound is vanillin, but it contains several hundred additional flavor compounds. The result is a deep flavor, with many nuances and complexities. Depending on the region where the vanilla is grown, the resulting extract will have unique flavors. The most common varieties are Madagascar, Mexican, and Tahitian vanillas. Do not confuse PURE extract with Imitation varieties. In order for extract to be labeled as PURE extract. the US FDA requires the solution to contain 35% alcohol and 13.35 ounces of vanilla extractives per gallon of extract. So, then what is imitation vanilla? This flavor uses the primary flavor compound, vanillin, to artificially produce a vanilla flavored solution. Vanillin is typically extracted from wood pulp (guaiacol), so the mixture can be considered a natural flavoring. It is typically combined with water, alcohol, sugar, and food coloring to create a cost effective alternative to pure vanilla extract. If you’re looking for the flecks of vanilla bean, but not the expense of using the whole bean, vanilla bean paste is a great option. 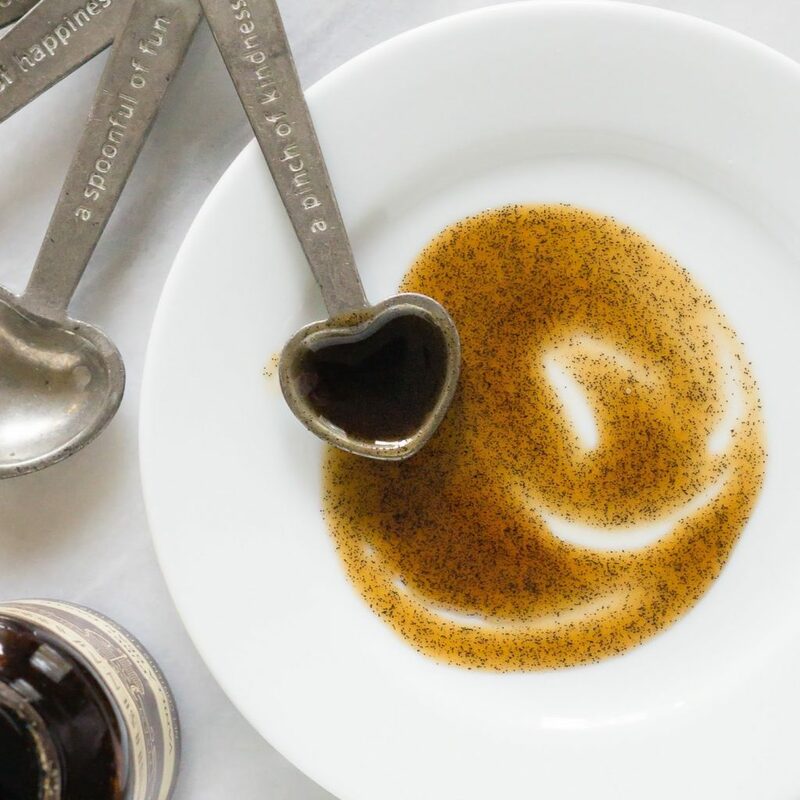 This sticky sweet syrup is a mixture of vanilla bean extractives, water, a sweetener and a natural thickener. It is similar to the consistency of syrup or molasses and contains the quintessential vanilla bean flecks. This is great for use in products that will showcase those pretty, little beans (white frosting, sugar cookies, vanilla ice cream, creme brûlée, panna cotta, etc.). You can use vanilla paste in a recipe calling for vanilla extra at a 1:1 ratio. Additionally, you can use the paste in place of scraping the seed from a whole vanilla bean. 1 Tablespoon of paste will replace one vanilla bean. You can’t, however, use paste in place of a bean if it is being steeped in a liquid. The only product for this is the bean itself! Another option, that is gaining popularity, is vanilla powder. This product is made from dehydrated vanilla extractives combined with cornstarch. 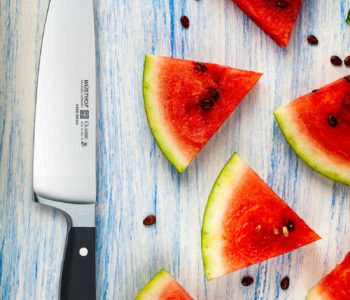 It is light in color, allowing you to add this to foods that are sensitive to the dark color of traditional extracts (white frostings and cakes). It is also great to use drinks (no added alcohol) and dry baking mixes or spice rubs (no moisture). The flavor differs slightly from extract. It is sweet, mellow, and creamy with a velvety aftertaste. Imitation vanilla powders are becoming more common and will contain a laundry list of ingredients. They don’t offer the same purity as a natural product, so check the ingredient list. Read more about vanilla powder here. The last option for your fix is vanilla sugar. This is the combination of dehydrated vanilla bean extractives and sugar. You can use this cup for cup in your baking, but a better use is to highlight it as a topping. Use it in drinks, on fresh fruit, your morning oatmeal or French toast. The result will be the influence of a sweet, creamy vanilla. So… back to the vanilla identity crisis. After researching about all the ways to consume vanilla, I was left with lingering questions: Where and when should I be using these vanilla products? 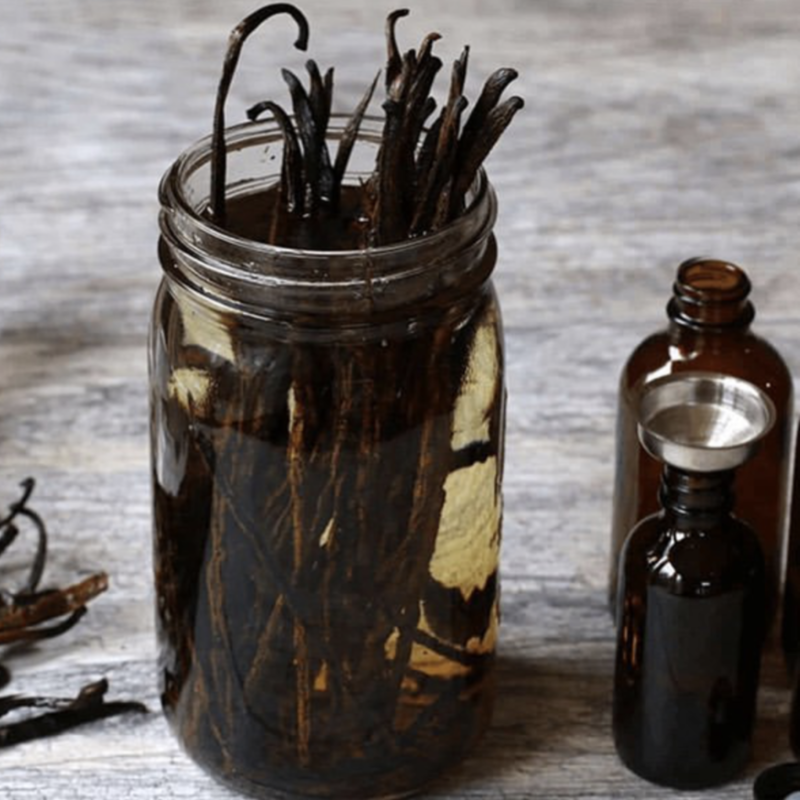 Can imitation vanilla replace pure extract? What products should I be stocking in my pantry? In order to answer these questions, we conducted ourselves a Gygi Taste Test. I wanted to try two recipes – one where in the extract would be baked and one where it wouldn’t. So, we made sugar cookies and buttercream frosting. I chose a sugar cookie recipe from by Stella Parks from Serious Eats. I knew the simplicity (and the full Tablespoon of extract) would allow the flavor to be showcased. I baked four batches of cookies, each using a different source for vanilla flavor: Traditional Mexican Vanilla, McCormick Imitation Vanilla, Nielsen Massey Madagascar Bourbon Pure Vanilla, and LorAnn Butter Vanilla Emulsion. 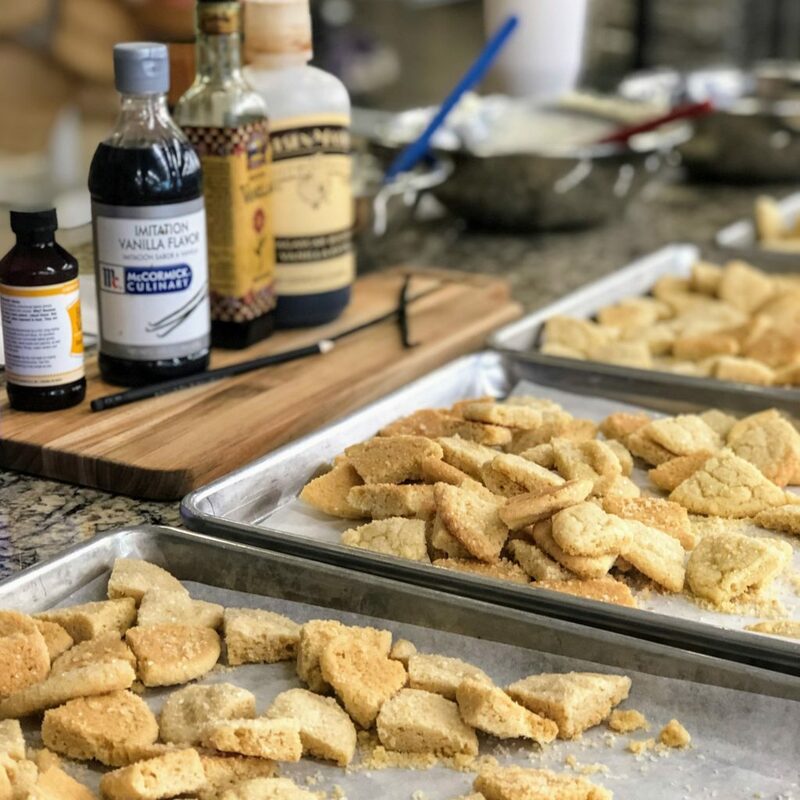 Each recipe was made identical – with only the type of flavoring varying. I also made a batch of Cake by Courtney’s Classic Buttercream frosting. We make hundreds of batches of this frosting every month for our cake classes, so I knew it would be a good canvas for this test. I divided the batch into two bowls and added two teaspoons of Nielsen Massey Madagascar Bourbon Pure Extract to one bowl and two teaspoons of McCormick Imitation Vanilla to the other bowl. Then I headed out to our retail store to test unsuspecting customers. Each test subject sampled 1/4 of each of the cookies. They were sampled at random, without the subject knowing which type of flavoring had been used. Then, they anonymously and privately chose their favorite cookie, based on the flavor. They were then given a sample of the two types of frosting and they recorded their favorite. Pure vanilla extracts do not perform well in baking. But neither do imitation extracts. There is a scientific reason for this. It has everything to do with he volatile nature of alcohol. 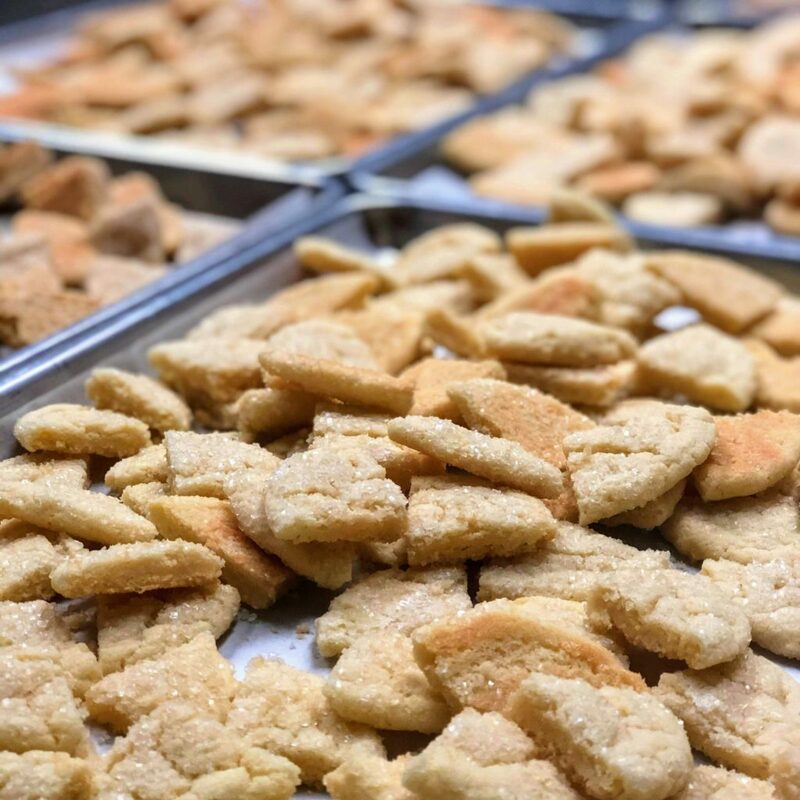 When it is exposed to the prolonged heat in the oven, the unstable alcohol leaves the batter or dough, taking with it the flavor it was intended to impart. The flavor basically fizzles out, leaving the food flat. The bakery emulsion performed well in the taste test, because it is a flavoring mixed suspended in water. No alcohol to bake out means no loss of flavor. We knew this emulsion stood a good chance of winning this contest and we are happy we included it in the taste test, but we realize that is like comparing apples and oranges. However, if you are looking for a cost effective replacement for pure extract, bakery emulsions are a fantastic option, and this taste test proves that. Now, the Mexican vanilla we used. It was the best extract in the competition! This is likely do to the fact that it was a “traditional” extract, not a pure extract. The formulation of this extract is: vanilla bean extractives, water, 10% alcohol (compared to 35% in the pure extract), and less than 1% vanillin. This is basically a blend of pure and imitation extract! Best of both worlds! And the price is much more affordable than pure extract. 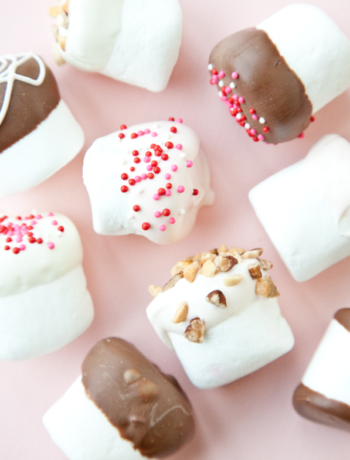 Now, let’s talk frosting! The pure extract won that contest! This is due to the fact that the frosting was not baked, allowing the complex and nuanced flavor to shine! 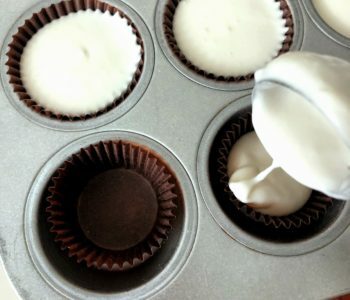 I will say, subjects who like the imitation frosting complained that the pure extract frosting tasted “bitter” or “boozy.” I enjoy that aftertaste (as do the majority of our test subjects), but so much of flavor preference is influenced by familiarity! How will this research and experimentation influence my future use of vanilla? First, Nielsen Massey Madagascar Bourbon Pure Vanilla will always and forever have a place in my pantry. I know it’s expensive. I know it performed poorly in the cookies. But it’s worth it to me to keep for food when it can show off. Here’s why I’ll spend a little more to have this on hand. First, I love love love it. The sweet, velvety vanilla flavor speaks to me!! It’s versatility works well in sweet AND savory dishes. The unique flavor comes from the region the beans are grown in- the Bourbon Islands of Madagascar. The rich flavor and unique curing process develops a distinctive taste. I’ve never found any vanilla flavor I like more than this! Plus, I trust Nielsen Massey to provide a product that is ethically sourced! Knowing that the farmers caring for the vanilla beans are being compensated fairly, that’s goodness right there! This justifies my investment in a bottle of vanilla. Next, I will be adding Blue Cattle Truck Traditional Mexican Vanilla to my baking line-up. I like that it contains natural ingredients and it supports a single-source farm in Veracruz, Mexico. Also, the product in imported and bottled local to me (Springville, Utah). I like the warm, spicy taste of this Mexican vanilla. I think it compliments my baking efforts and my family loves the food I make with it. Especially my husband (he grew up on Mexican vanilla). I also am thrilled to know that this Mexican is coumarin free. This is a carcinogenic acid used by many manufacturers to age the vanilla beans quickly. Blue Cattle Truck products are coumarin free!!!! I’m also excited to do more experimenting with bakery emulsions. I have dabbled with their flavors, but I intend to do more experimenting with them. The flavor options are extensive (25 flavors!) and if they all perform as well as the butter vanilla variety, they just might be the bit of magic my baking needs. This vanilla project has helped me feel more educated as a baker and a consumer. 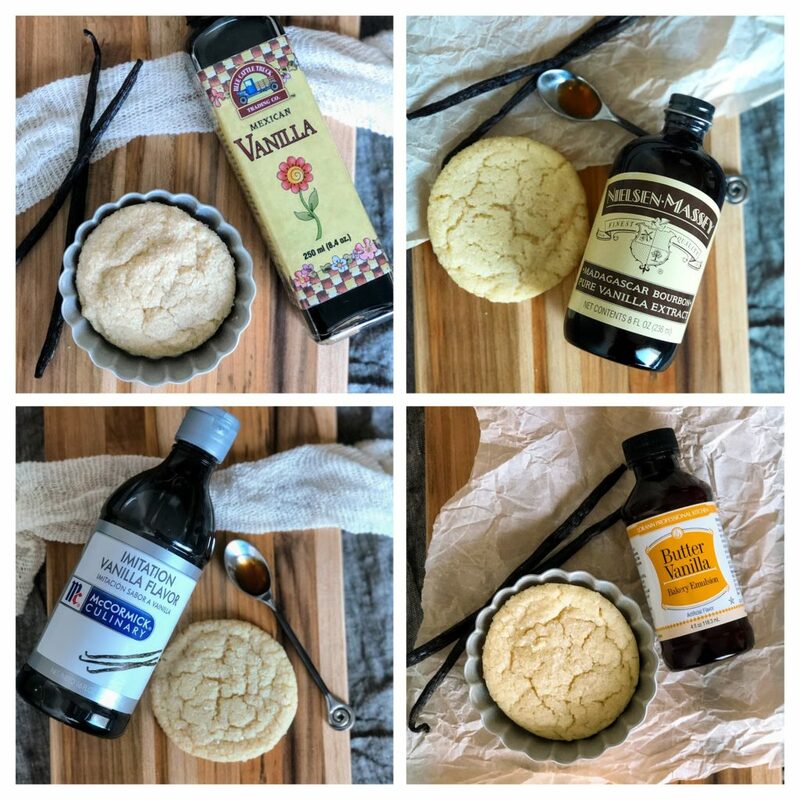 I feel confident about my vanilla usage, knowing that I have products in my pantry to accomplish any baking feat! My goal in sharing this information is to help you become an educated consumer as well. I don’t think vanilla is a one-type-fits-all type of product. I think you need to pick the vanilla that is the best product for your kitchen. If you find yourself with more questions after reading this, please leave a comment here! We intend to keep addressing vanilla for a while. You can also join us over on Facebook and Instagram where the party goes on daily!! Everyday Hot Chocolate with The Food Nanny Bakery Emulsion - The flavor boost your baking needs!